Our Year 5 pupils had an amazing experience at this year’s PGL at Windmill Hill. Across the three days, the children tried lots of new challenges and pushed themselves to take on new risks and test their limits. Activities included high-ropes challenges, abseiling, team-building activities, climbing walls and Aeroball…just to name a few. I’m sure many of the children will have learned a lot about themselves, their potential and their abilities and, more importantly, had lots of fun doing so. Thank you to all of the PGL staff at Windmill Hill and to Mr Rumsey, Miss Andrews, Miss Henman and Mr Kohli who supervised and supported the children, superbly, across the three days – a weekend rest is well-deserved! Not all of the children went on the Year 5 PGL trip and those who didn’t were set an ‘Enterprise Challenge’ where they had to plan, design and make a project in school. 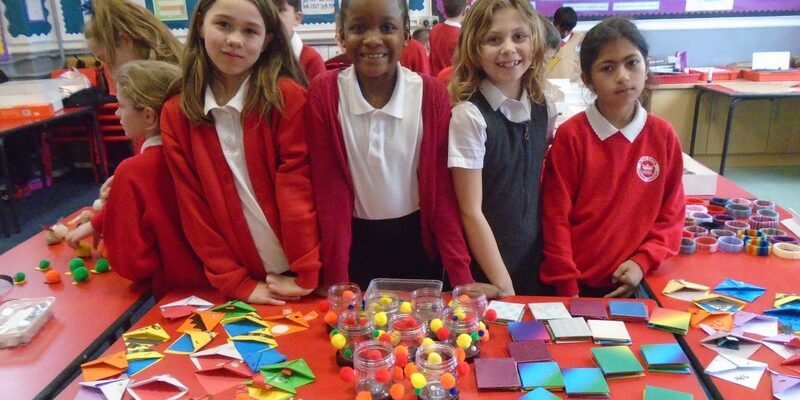 Thank you to all of you who supported the Year 5 children by buying one of their cakes or hand-made crafts – I believe the cakes were extremely tasty and the gifts had great reviews! The children have decided to give any profits they made to Comic Relief which I think is an incredibly mature and grown-up decision. Well done to all of the children who took part and to Mrs King and Mrs Wells who guided them through the challenge. If you bring your child to our Breakfast Club or Afterschool Club, you may have already seen our brand new outside learning space – ‘The Pod’ – which is situated next to the swimming pool. Made out of natural timbers and a beautiful perspex canopy, The Pod will be used as an outside classroom and a quiet reading, writing and drawing area during break and lunchtime. We are also having some new bike and scooter racks installed nearby, so look out for those! Isabella H in Year 4 was the lucky winner in this week’s ‘Attendance Raffle’. Finally, I hope you will be able to join us for the Spring Parents’ Evening, taking place on Tuesday 19th and Wednesday 20th March. I urge you all to make an appointment to meet with your child’s class teacher if you have not already done so. I look forward to seeing you then.